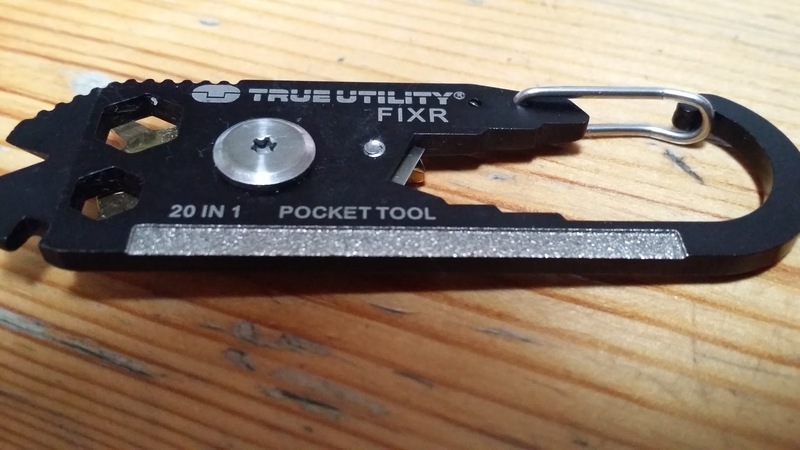 The good folks at True Utility are back with another ultra-small keyring tool. 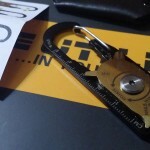 This time, they claim to have packed no less than 20 tools onto a single carabiner-style device. But is it worth the space on your keyring? 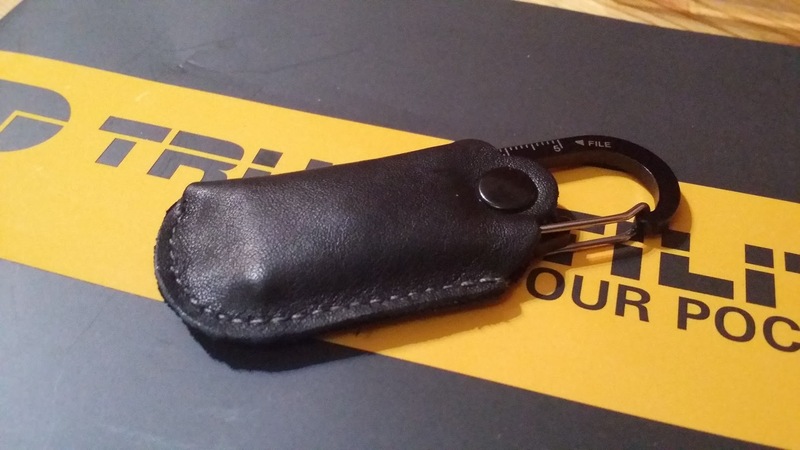 Here at Pocket Sized, we like stuff that can attach to a keyring, and provide ‘always available’ tools when you’re out and about or find yourself in a sudden fix. Of course, your expectations need to be set appropriately. We love the Spyderco Bug but we don’t suggest you leave your machete at home when you decide to go on a trek through the jungle. Aiming for too much functionality or exaggerating functionality. 5 extras tools mean nothing when they don’t work properly. And please don’t list things like a keyring hole as a tool. Low functionality. We don’t need a ‘fruit peeler’ in our wallet at all times. Poor construction. Hey! I do have a screwdriver (*snap*). Oh. People tend to be very forgiving of poorly designed mini-tools, because they don’t use them frequently. Then, when it comes to a sudden need to dismantle something, the tool lets them down. 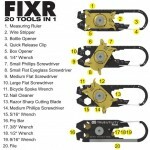 What we’re looking for in tools like the Fixr is weight-to-usefulness ratio. 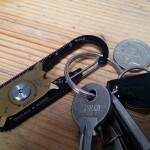 If we can clip a tool onto a keyring and forget it’s there except when we suddenly need a small file, then we’re happy. And that’s what we did with the Nite Ize Doohickey, which is our current favourite tiny multi-tool. The best tool is the one you have with you! After becoming accustomed to True Utility’s hard plastic box containers, this one is slightly disappointing. It’s a standard clear plastic box, presumably saving space on the shelves, although not as ‘giftable’ as previous packaging. Still, it’s better than a blister pack and isn’t bad, all things considered. There seem to be versions in the hard case, and also in a tin out there, so keep your eyes out. In the box we have the tool itself, a (genuine!) leather pouch and instructions. The pouch is a nice touch. So far so good. The tool itself seems well constructed and finish seems decent. It couldn’t be described as heavy, but it’s certainly a larger and weightier item than the Doohickey. The biggest difference from most competing tools is a spinny metal gizmo with screwdrivers and nail cleaner attached. This seems to be to provide better leverage than is usually possible, and given the issues we saw in the Swiss Tech Utili-key, this may well be a good idea. You’re not going to be disappointed opening up the Fixr. Let’s see how the 20 tools stack up. We like our carabiners to require decent force to open, particularly out of the box. They inevitably loosen over time which can mean your favourite tool ends up lost before you realise that your pockets are suddenly lighter than they were before. The Fixr’s carabiner is OK. It’s not as snappy as we would like, but it is not obviously too loose. Could it be accidentally pressed open in your pocket? Probably. Is this very likely to happen? We don’t think so. It’s hard to screw up a bottle opener, especially considering you can open a beer bottle with a banana. This one a is a little strange. The opener is actually underneath the carabiner clip which makes it kind of backwards to use. You can certainly open a bottle with it, but would you want to? We’re not sure. Our nails are now impeccably clean. +1 to the Fixr. 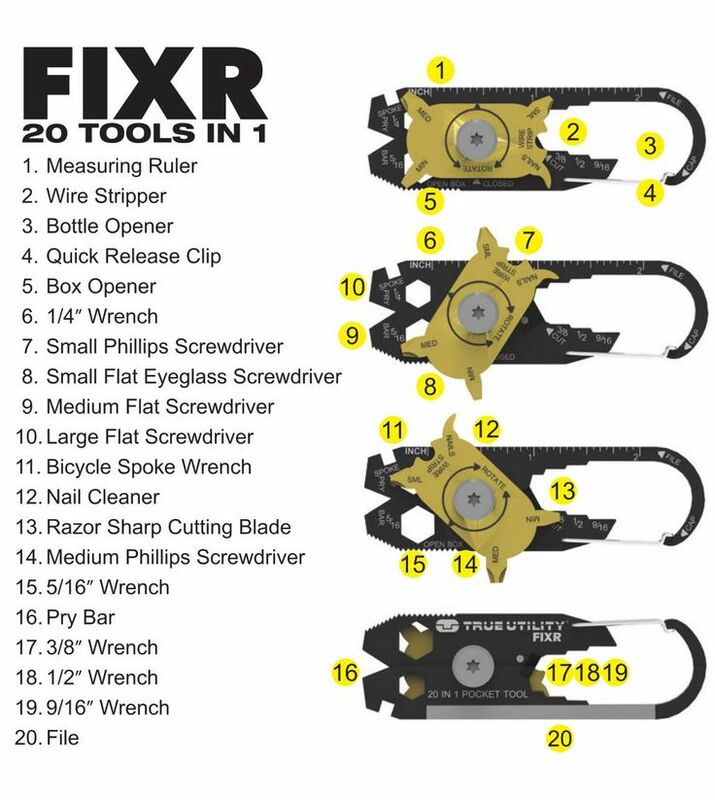 The Fixr sports no less than five screwdrivers – three on the whirly gold part, and two built into the main body of the tool. The two flat-headed screwdrivers on the main body are all well and good. You can get a good grip on the Fixr because there are not sharp edges, and this works well. Unfortunately, the Philips screwdrivers on the spinny attachment are very poor. One of them is claimed to be an eyeglass screwdriver, but unless you’re wearing those monstrous massive metal things the optician puts on you before determining which lenses fit you best, you are not going to be tweaking your spectacles with the Fixr. The idea is very good, in principle. Because you can rotate the screwdriver heads, you can manoeuvre them into a position where you have the best grip. This aspect works very well. But the manufacturing precision just isn’t there, and so the screwdrivers points are well away from being usable for day-to-day tasks. 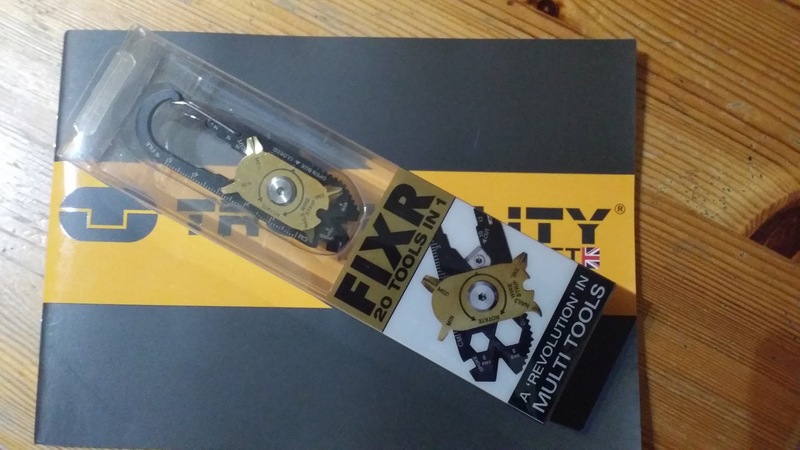 Indeed, because the tool is made from a decent quality of material, you are unlikely to want to whip out the Fixr when someone needs their screws tightening. You’re more likely to frustratedly strip away any hope of using screws again. Could you unscrew your way out of locked bathroom with the Fixr? Sure. You’re going to need a better screwdriver for everything else. This one is a big disappointment because no-one has cracked screwdrivers on a micro-tool, and we hoped this would be the tool that finally did it. Check out the gallery below for our attempts at a close-up on the screwdriver bits. By contrast, the Fixr’s wrench/spanner sections are very usable. Again, the absence of sharp and pointy edges around the main body of the tool gives a great opportunity for grip, and so these work well – better than most similar tools. A spoke wrench is fairly niche in a tool of this type. How often do you want to adjust your spoke tension? At the same time, it doesn’t detract from the tool, and in our testing did actually work on one of our bikes. We’ll give this one a thumbs up. 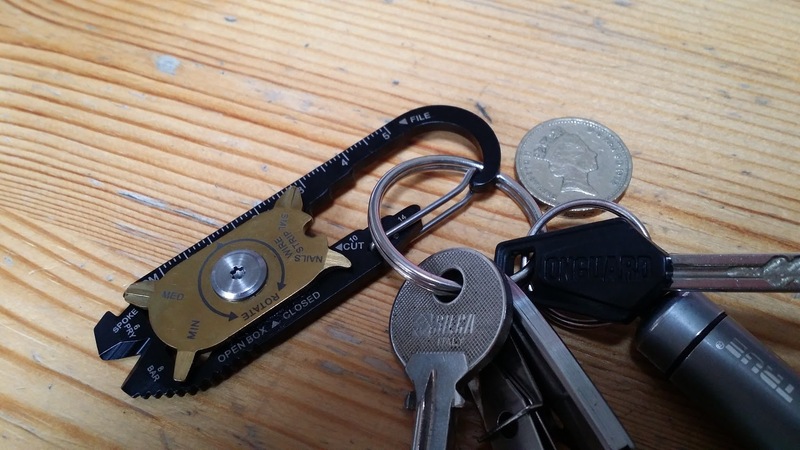 Most keyring blades opt for a blade that snaps out of the body of the tool, to allow for a longer cutting edge. 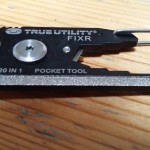 True Utility have opted to buck the trend and offer a small, sharp blade in the body of the tool. There are only so many things you can possibly cut with this arrangement, so it can’t be regarded as a knife replacement. But it’s decently sharp and actually not too bad. You can certainly chop string with it. If you see this as an added bonus, it’s quite a clever idea. The wire stripper is surprisingly effective. 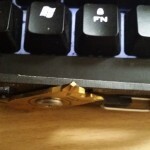 If you’ve ever found yourself haphazardly assembling electronics (we have!) and making do with a Stanley knife or trying to precision cut a wire with a pocket knife, this is actually a very decent alternative. You need to take some care, but it definitely works. Can you get a ruler wrong? 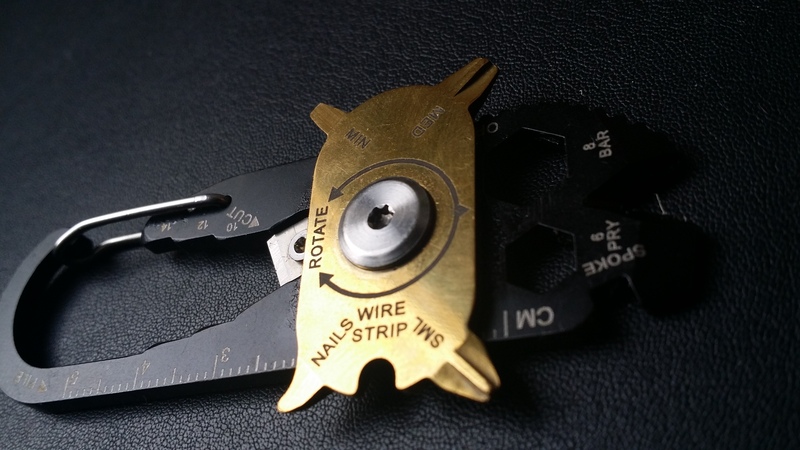 If you’ve ever bought a 22-in-1 credit card multitool, then you may know that you can. 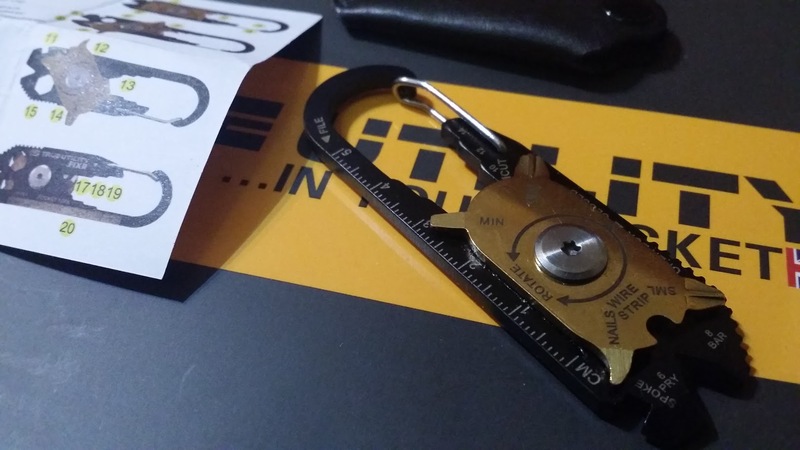 The Fixr’s measurements were approximately 1/2 mm too long over 50mm, but as an emergency ruler, it’s OK. Don’t draw up any blueprints with it. 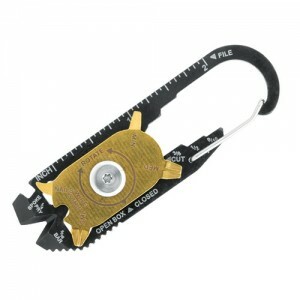 Cutting open a package is the perfect use-case for a pocket tool. Whether you’re at home or work, sooner or later, a parcel or box needs opening and your friends or colleagues will frantically search for scissors while you triumphantly reveal how prepared you are. The Doohickey has shown us that you don’t need a sharp knife to get the job done, so this should be well within the Fixr’s bounds. 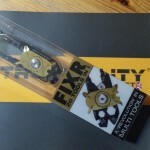 Without being too critical, the Fixr can open a box for you, but it isn’t great at it. Without a blade (like a pocket knife) or a pointed corner (like the Doohickey) more difficult packages need a fair amount of effort to open. Not enough that you can’t open the box, but enough that it feels like another tool would probably do the job better. Meh. If you say ‘pry bar’ to us, we think ‘crow bar’. Pulling doors off their hinges, breaking into safes, that sort of thing. 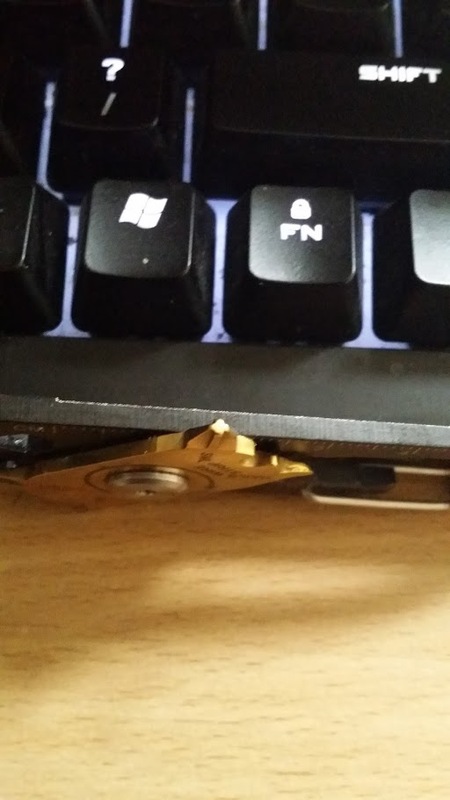 You can pry with the Fixr. It’s reasonable. it might come in handy at some point, although we don’t know specifically what that point would look like. One side of the tool has a metal file along the edge, which is a nice use of space. It’s fairly coarse, but a welcome inclusion. It’s more than capable of filing, and we don’t think we’ve seen a file included on a tool of this type before. It beats a Swiss Army Knife ‘metal with grooves in it’ file hands-down. 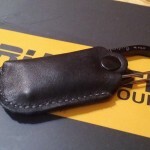 The Fixr is sturdy, reasonably priced and has a nice leather pouch. As a gift item, you won’t go wrong and any recipient will be pleased with it. Unfortunately, many of the more frequently used tools could be improved while the less every-day tools work well. If the (innovative) screwdriver spinny-thing was more effective, then this would likely be a must-have. Will it earn a place on our daily keyring? We’re going to record an open verdict. Perhaps we’re being a little harsh in our evaluation. We quite like the Fixr, all things considered. 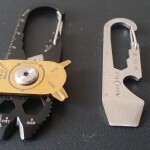 There really aren’t that many tools that go beyond a gimmick that weighs down your keyring, and the Fixr is certainly better than that. 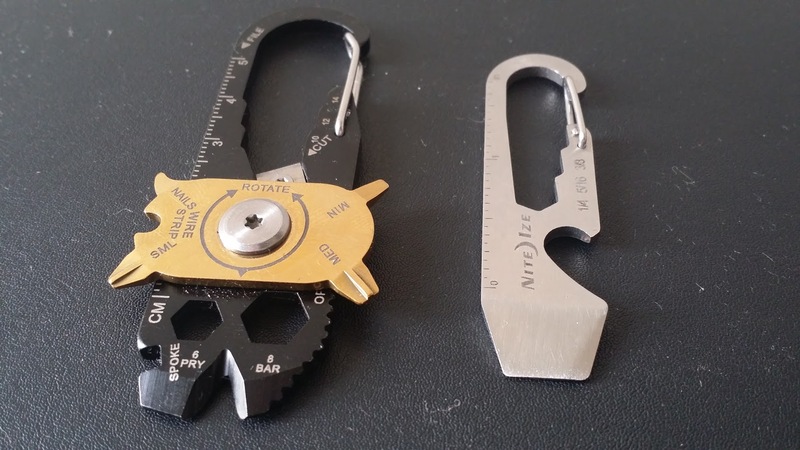 Is it the best micro-keyring tool? Possibly. Want us to test a particular aspect of the Fixr? Have a question? Just let us know in the comments below. Here’s a close-up of what’s in the box. 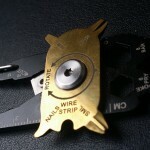 This is the spinny attachment with screwdrivers and nail cleaner, plus the cutting blade underneath. That screwdriver head is just not precise enough for us. I’ve got one of these and its pretty handy. I would agree with you that the screwdriver is not small enough but for something in your pocket all the time its still pretty good.